Altair Ignition Module for Triumph/Bsa/Norton unit/pre-unit twins with 360° crankshaft and 12 volt electrics, positive or negative ground. 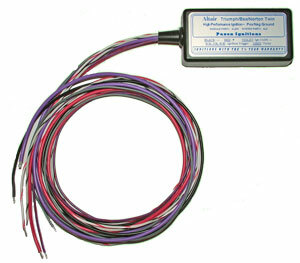 As supplied with Altair Twin Ignition System (AL2). So that we can supply the correct replacement when ordering, please confirm the date, firmware code and advance curve from the silver label on the back of your existing module. This information can be entered in the order message section, or sent to us by separate email.